Diwali is all about lights, sweets, bling and all that glitters. As I grew mature, my liking kept on drifting from crackers towards lights and other more thoughtful ways to celebrate this festival. As a responsible human being, I try not to contribute towards pollution and any other activity that is potentially harmful for the mankind. I love lights, glitter, food, colors, Rangoli, dressing up, decoration and Diwali Pooja. Every year I do some crazy shopping on Diwali and major part of my money is spent on home decor. This year, as I am in Australia, it's a little difficult to find that traditional Indian Diwali decor stuff so I thought of doing something creative at home and made some easy DIY projects so that I could decorate my home the way I would have if I were in India. 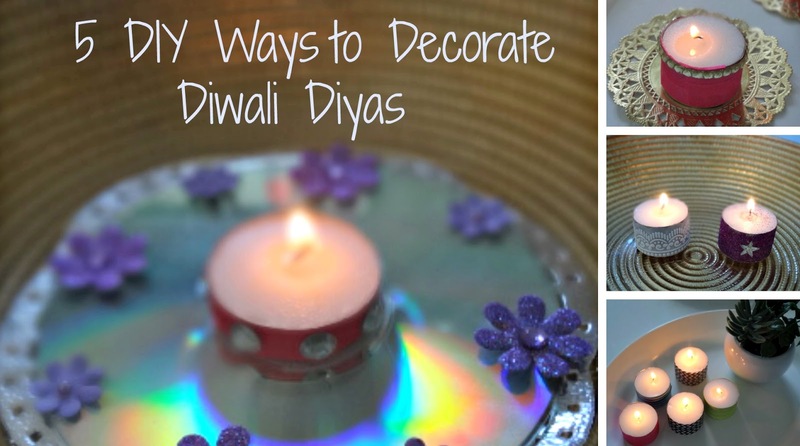 I loved the outcome so much that I now plan to make these diyas every year. These are so easy and quick to make that you can recreate these in less than half an hour.. literally. So lets get started and learn to decorate these diyas/tea lights for Diwali as well as upcoming Christmas. Washi tape is one of my favorite craft items because this is really inexpensive, easily available and comes in a zillion designs, colors and patterns to choose from. I chose some neon colors and matched them with chevron print and stripes and created my own set of these cool colorful tea lights. Aren't these super pretty ? For the next design, I just grabbed a beautiful white lace and stuck it on the outer edge of the tea light and that's all... incredibly easy.. Right ? The next design is one of my favorites. It looked the prettiest because of bold fuchsia color, rhinestones and metallic golden base. Despite of being the prettiest, it was equally easy to make. I just covered a tea light with washi tape, pasted some rhinestones on the edge and attached a golden paper doilie underneath as a base and just look at the final result..stunningly beautiful !! The next one is another favourite of mine. I used an old CD as the base of a tea light which was covered with washi tape and decorated with rhinestones. I glued some purple coloured flowers and attached a silver paper doilie for an added bling. I had not imagined that it would turn out to be this pretty. I also made some glitter and lace "diyas"..
Watch the video tutorial below to learn how exactly these can be made with ease. Do give these a try and beautify your home this festive season. You can use these on Christmas and any other special day. It took me less than 30 minutes to make all these and all the supplies were bought from Kmart, Australia for a very affordable price. Did you like my idea ? Which one would you like to give a try ? Tell me in the comments below.